Objective: Pregnant women infected with malaria represent a significant obstetric problem, especially in the face of antimalarial resistance. This cross-sectional study investigated the prevalence of malaria parasitemia, associated risk factors as well as the antimalarial resistance pattern of Plasmodium isolates from pregnant women attending four selected secondary health facilities in Kaduna State, Nigeria. Materials and Methods: Blood samples were collected from 353 pregnant women attending selected hospitals. Malaria microscopy and parasite density count were conducted based on standard protocols. Antimalarial susceptibility test (using chloroquine, artesunate, artether, and sulfadoxine-pyrimethamine), and hemoglobin concentrations were determined using schizont maturation assay and methemoglobin method, respectively. Multiple-drug resistance (MDR) was defined by resistance against ≥3 antimalarial drugs. Results: The overall prevalence of plasmodiasis was 22.4%. Out of those infected, 5.2% was found to be anemic. Malaria parasitemia was significantly associated with parity, residential area, age of women, and use of preventive measures against malaria (P < 0.05) but not with hemoglobin concentration, occupation, and trimester of pregnancy (P > 0.05). Malaria parasites from the pregnant women exhibited the highest resistance against chloroquine, 75 (94.9%) followed Artemether, 30 (37.9%) then sulfadoxine-pyrimethamine, 29 (36.7%) and least resistant to artesunate, 28 (35.4%). The prevalence of MDR was 40.5% (32/79). Conclusion: The prevalence of malaria was relatively high due to inadequate and/or ineffective preventive measures adopted by pregnant women. More so, significant isolates of Plasmodium falciparum exhibited MDR against antimalarial agents tested. Pregnant women infected with malaria represent a significant obstetric problem that predisposes them and their unborn baby to adverse consequences. Findings from clinical studies revealed that 25% women with placental malaria had evidence of malaria during parturition . In most endemic areas, malaria during pregnancy is associated with maternal anemia. It has been estimated that about 26% of maternal anemia is due to malaria. In Africa, it was reported that severe anemia as a result of falciparum malaria is responsible for approximately 10,000 maternal deaths per annum . Infants with congenital malaria also experience devastating effects from the infection. It has been estimated that 1 in every 5 low birth weight (≤2500 g) deliveries are a consequence of maternal malaria. This invariably results in poor infant development and survival and has led to approximately 100,000 infant deaths every year ,. Despite the public health priority given to malaria, in recent times, the parasites have developed resistance to most of the commonly available prophylactic and therapeutic antimalarial agents ,. In view of this, there is a crucial need for periodic antimalarial sensitivity testing. The main objective of antimalarial sensitivity testing is to evaluate parasite(s) sensitivity to increasing antimalarial dosages. This approach allows for the complete exclusion of interfering host immunity and metabolism of the compound, thus offering an accurate evaluation of drug impact on parasites . Over the past five decades, antimalarial resistance by Plasmodium falciparum has become an issue of utmost concern. There are several methods for the assessment of parasite growth inhibition by antimalarial drug testing, using either in vivo or in vitro testing. The in vivo approach  uses a standard dose regimen of chloroquine and daily parasite checks for 7 or 28 days. The results permit classification into sensitive response, recurrence, overt resistance, and high resistance. This type of test can also be run with other antimalarial drugs, provided the period of the posttreatment follow-up is adjusted to the half-life of the medication employed . In vivo antimalarial tests have various drawbacks, especially the need for regular checks over a relatively long period, the strong influence of host immunity on test result outcomes, the purely qualitative nature of the results, and eventual clinical deterioration in cases of high resistance responses .In vitro assays have become indispensable tools for surveillance of drug resistance and planning therapeutic guidelines. These include the schizont maturation assay, radiolabeled hypoxanthine isotopic assay, malaria histidine-rich protein 2 and lactate dehydrogenase quantification by enzyme-linked immunosorbent assay and nucleic acid amplification tests (such as polymerase chain reaction [PCR]) ,. The ideal approach for detecting and monitoring antimalarial resistance is the use of a PCR. This method detects the genes responsible for resistance, and results are usually available within 8–12 h with high sensitivity and specificity. However, the need for technical training of laboratory personnel (especially in developing countries) and the relatively high cost of procurement and maintenance limits PCR applicability in resource-limited settings . In Nigeria and other endemic areas, malaria is a major etiology of morbidity and mortality, particularly among pregnant women ,. In 2015 alone, there were an estimated 214 million new cases of malaria and 438,000 deaths worldwide. Of these, Nigeria accounted for up to 25% of global cases and deaths with 500,000 cases in pregnant women ,. The physiological attributes of pregnant women and the pathology due to malaria exert synergistic effects on each other, thus making both the mother and the child vulnerable to adverse consequences ,,,. This study investigated the prevalence of malaria parasitemia and associated risk factors, as well as the antimalarial resistance patterns of Plasmodium isolates, from pregnant women seen at four selected secondary health facilities in Kaduna State, Nigeria. This study was carried out between February 16 and April 28, 2015 (during the dry harmattan season) at the antenatal clinics of General Hospital Kawo, Yusuf Dantsoho Hospital, Gwamna Awon Hospital, and Barau Dikko Hospital, in Kaduna State, Nigeria. Kaduna lies at latitude 10°20′ north and longitude 7°45′ east and covers an area of 45,711.2 km 2. It has a population of 6,113,503 and a population density of 130 people/km 2. It accounts for 4.3% of Nigeria's total population. Kaduna lies in the savanna ecological belt. It experiences a rainy (wet) season between April and October and a harmattan (dry and dusty) season between November and March. The area experiences an average annual rainfall of 1099 mm and average daily temperature of 28°C. Malaria occurs all year round, with peaks during the middle to late rainy season. This was a cross-sectional study involving 353 randomly selected pregnant women who came for antenatal consultations in four health institutions in Kaduna state, Nigeria. A questionnaire was given to an individual pregnant woman. This was either self-administered or filled in by a trained interviewer for those who could neither read nor write. The questionnaire was designed to get information on sociodemographic data and knowledge and use of preventive measures against malarial infection. The information collected including age, occupation, level of education, gestational age, utilization of three doses of intermittent preventive therapy (IPT)-sulfadoxine-pyrimethamine (SP), use of insecticide residual sprays (IRS) and mosquito bed nets. The women who adopted IRS made use of it on a weekly basis while the spray remains effective (at least 3 months before the expiration of DDT). In Kaduna State, the only available malaria preventive policies for pregnant women were distribution and use of insecticide-treated nets (ITNs) and IPTs-SP. However, there is no guarantee that all women made proper use of the ITNs at home. Purposive sampling of women was used, and all pregnant women who met the inclusion criteria were included in the study. Pregnant women at any gestational age who resided within the study area were included in this study. Women with chronic debilitating diseases such as malnutrition and human immunodeficiency virus (HIV) infections were excluded because these conditions may affect the hemoglobin concentrations of affected persons. Interviewer-based structured questionnaires were administered to pregnant women after obtaining informed consent. These questions included information on women sociodemographic variables, obstetric history, use of three or more doses of IPT and ITN, and other malaria preventive measures. We also reviewed their antenatal cards to ascertain information such as gravidity and gestational age of the subjects. Administrative and ethical clearances were obtained from the Ethical Research Committee of Kaduna State Ministry of Health, Kaduna State, Nigeria. Consent forms were issued, and in some cases, read and explained to the women. The objectives and procedure of the study were explained to the participants, and those who agreed to be part of the study indicated so by signing the consent form. In cases where written consent was not possible, verbal approval was granted by participants. Both forms of informed consent are acceptable by the Ethical Research Committee of Kaduna State Ministry of Health. Samples were collected by standard phlebotomy. About 3 ml of venous blood was collected aseptically in ethylenediamine tetraacetic acid containers. Thin and thick smears were made on clean, grease-free slides. The parasite species were identified by preparing thick and thin blood films on microscope slides using Giemsa staining techniques as described by Cheesbrough . Hemoglobin was determined using the methemoglobin method of Ochei and Kolhatkar . Thick films were used to detect malaria parasites in the blood samples. Three drops of blood were placed in the center of a clean grease-free microscope slide to cover an area of 15 mm in diameter. The smears were allowed to air-dry and then flooded with 10% Giemsa stain which was retained for 10 min before the stains were washed off with water. Parasite species and morphology were determined by microscopic examination of thin films which were also prepared with the 10% Giemsa stain. Microscopic examinations of the stained slides were done using an oil immersion objective lens (×100 objective). The parasite density in each sample was determined by multiplying the average number of parasites in the sample by a factor of 500, which was proposed by Cheesbrough . Multiple-blinded readings for validation of the presence or absence of parasites and of the estimated parasite density were done by certified microscopists with over 5 years of working experience in malaria microscopy. The schizont maturation inhibition technique was used. The antimicrobial actions of chloroquine, artesunate, artether, and sulfadoxine-pyrimethamine on the isolated Plasmodium species were assessed. These drugs were purchased from the shelf (pharmacy store). Stock solutions of the antimalarial drugs were prepared as described below. The drugs were made into equal concentrations of 100 mg/mL by dissolving in the appropriate amount of distilled water. A 50 mg tablet of artesunate was dissolved in 0.5 mL of the distilled water, 250 mg of chloroquine was dissolved in 2.5 mL of distilled water, and 250 mL of artemether in 750 mL of distilled water. They were allowed to dissolve and the suspensions were shaken thoroughly to obtain homogenous solutions. Two-fold serial dilutions of each of the drug suspensions were prepared by adding 1 mL of the suspension into 1 mL of distilled water in the first test tube. From the first tube, 1 mL of the solution was taken and added into the second tube already containing 1 mL of distilled water. This was done to the fifth tube for all drugs. Malaria-infected blood samples were centrifuged at 2000 rpm for 5 min. After centrifugation, the plasma and buffy coats (leukocyte interface) were discarded, and 0.2 mL of the packed red blood cells was dispensed into thirteen test tubes for each of the samples. The tubes contained different concentrations of the drugs in duplicate. A control (tube without drugs) was set up for each of the samples. A total of 1 mL physiological saline was dispensed into each of the tubes. After addition, lids were placed over the tubes, and the tubes were shaken gently to dissolve the drugs. The samples were then incubated at 37°C for 42 h. At the end of incubation, thick and thin blood films were prepared from the samples in each tube including those of the controls. The numbers of schizonts or gametocytes in the control tubes were compared with those in other tubes containing different concentrations of the antimalarial drugs. The data obtained from the questionnaire and the results of the laboratory analysis were entered into Microsoft Excel and analyzed using SPSS version 20, (IBM, California, USA). Data were submitted for descriptive statistics (frequency tables and pie chart). The Chi-square and Student's t-test were carried out as two-tailed and outcomes, and probability values below 0.05 were considered statistically significant. In total, 353 pregnant women in various pregnancy trimesters were recruited for the study. They were between 17 and 44 years old with a mean age of 22.45 ± 6.84 (± standard deviation). Among the recruited women, 271 (76.8%) were multigravidae, 2.0% were in the first trimester, 62% in the second trimester, and 36.0% in the third trimester. The majority (51.6%) were homemakers [Table 1]. All the malaria positive cases were that of P. falciparum only. The overall prevalences of malaria parasitemia and anemia (hemoglobin concentration <9 mg/dL) were 22.4% and 5.2%, respectively. Women in the second trimester had the highest number and percentage of cases of parasitemia 51 (64.6%) with the least in women in the 1st trimester, 1 (1.3%). 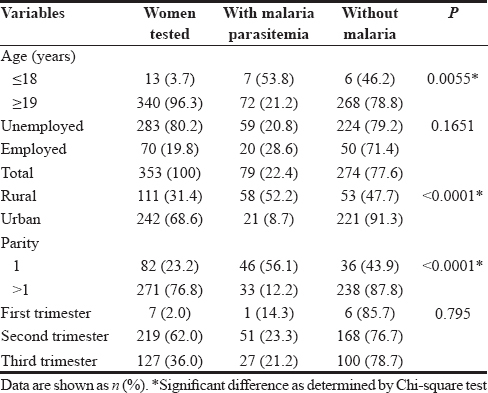 Malaria parasitemia was significantly associated with the trimester of pregnancy (P< 0.05) [Table 1]. Women with a first pregnancy had higher malaria parasitemia (46 cases, 56.1%) than the multigravidae (33 cases, 12.2%). There was a statistical association between malaria parasitemia and parity (P< 0.05). The prevalence of malaria parasitemia was higher in the ≤18 year age group (53.8%) than ≥19 year age group (21.2%). Women who were employed had a relatively higher prevalence of malaria parasitemia (28.6%) than those who were unemployed (20.8%). Rural residents had more cases of malaria than urban residents. 58 (52.2%) versus 21 (8.7%) [Table 1]. The mean hemoglobin concentrations in women with mild, moderate, and severe malaria parasitemia were 12.3 ± 0.93, 10.8 ± 0.47, and 9.5 ± 0.0, respectively. There was no statistical relationship between malaria density and hemoglobin concentration in these pregnant women (P = 0.077). Three of 79 women (3.8%) had malaria/HIV coinfection. Women who used no or one preventive measure during pregnancy had a higher prevalence of malaria parasitemia (74 cases, 26.0%) than those who used >1 measures (5 cases, 7.4%). There was a statistical association between the use of malaria preventive measures and incidence of malaria parasitemia (P = 0.0009) [Table 2]. One-hundred and fifteen (32.6%) women did not use any preventive measures during pregnancy, 45 (12.7%) completed their 3-dose IPT, 53 (15.0%) persistently used ITNs, and 72 (20.4%) consistently used IRS while 68 (19.3%) used a combination of more than one of these preventive measures [Table 3]. Malaria parasites from pregnant women exhibited the highest resistance against chloroquine (75 cases, 94.9%) and the least resistance to artesunate (28 cases, 35.4%). The prevalence of multidrug resistance (MDR) was 40.5%. There was no significant association between MDR and malaria parasitemia in pregnant women (P = 0.092) [Table 4]. The prevalence of malaria parasitemia in this study was 22.4%. This value could be due to low coverage level and effectiveness of SP usage in the study area which was below 16% for the recommended three doses or perhaps due to increased SP resistance. Compared with the 1990s, the relatively lower prevalence rate of malaria observed among pregnant women in this study could be a result of increased use of malaria prevention tools such as ITNs and IRS . The results of this study differ from those of Ogbu et al. . who recorded a higher prevalence rate of 38.8%. This may be due to the fact that the study was carried out only during the dry season when the infection rate could be relatively higher. According to the 2015 Nigeria malaria indicator survey, 62.3% of pregnant women within 15–49 years old had and used at least one ITN. Northwestern Nigeria, in which Kaduna State is located, had the highest recorded use of ITN by pregnant women (72%) but only 16% of women in Kaduna State had IPT with 3+ doses during pregnancy. However, only 17% of pregnant women in Kaduna State knew and used information about malaria preventive measures 6 months before the analysis . In this study, 53 (15.0%) pregnant women were reported to own ITNs and consistently slept under them. This value is low compared with other studies ,. The reasons could be that they lacked money to buy the nets, they had not received ITN during public health distribution campaigns, or they disliked using mosquito nets. The prevalence of malaria was significantly higher among primigravidae than multigravidae. This result is consistent with findings from other similar studies in malaria endemic areas in the tropics, which reported higher prevalences of P. falciparum malaria in primigravidae than multigravidae ,. The decrease in malaria prevalence in multigravidae could be associated with the development of preimmunity to malaria with increased parity whereas primigravidae remain susceptible to malaria due to partial development of immunity . Pregnant women in their second trimester had the highest prevalence of malaria compared with those in their first and third trimesters. Similar findings were documented by authors in other parts of sub-Saharan Africa, in which the highest malaria prevalence and parasite density were reported among women in their second trimester ,. In this study, the prevalence of anemia was as low as 5.2%, and there was no significant association between anemia and density of malaria parasitemia. The reason for this could be that most women were on oral iron supplementary tables and eat appropriate diet for pregnant women. These could have boosted and maintained their hemoglobin concentrations and red cell indices. In this study, the risk factors found to be significantly associated with P. falciparum malaria included the use of SP prophylaxis and ITNs. Despite the low coverage of SP, we found it confers some protection against malaria. This observation was also reported in another study . Even though few women used ITNs, women who used them were effectively covered against malaria. ITNs effectively reduce human-mosquito contact and thus reduce malaria transmission among those who use them. In view of this, the ongoing distribution of ITNs among pregnant women in antenatal clinics in Nigeria should be sustained and be made free of charge. This could significantly help reduce the transmission of malaria. Findings from this study revealed that maternal age, place of residence, and gravidity were associated with the prevalence of malaria. Pregnant woman ≤18 years old had the highest prevalence of malaria parasitemia. This is in conformity with a report in Lagos, Nigeria where higher cases of malaria were observed in younger age groups . Clinical studies showed that malaria parasitemia was higher during first pregnancies and lower in subsequent pregnancies . This is because pregnant women lack the specific immunity to placental malaria acquired during previous malaria episodes . This immunity accumulates with successive pregnancies, provided there is exposure to malaria infection . There was an association between malaria parasitemia and the use of various preventive measures. It was observed that 11.3% and 40.0% women who used ITN and SP, respectively, had malaria parasitemia. Hence, there is a need to encourage the consistent use of preventive measures and also look for factors that further influence IPT-SP uptake, such as health system related factors as well as perceptions about SP intake. In vitro drug sensitivity is important in monitoring antimalarial effectiveness to establish the baseline sensitivity of malaria to commonly prescribed antimalarials .In vitro resistance against chloroquine, artether, and artesunate were observed among the malaria-infected pregnant women in this study. These results conform to earlier findings of Fall . Similarly, malaria resistance against chloroquine and artemisinin-based antimalarial agents has been reported previously in Nigeria ,. The host cell responses to antimalarial drugs are controlled by the pharmacokinetic properties of the drugs and preformed immunity in the patients, as well as the complexity of infections in high-transmission areas ,. These factors may contribute to the range of variation in the clinical expression of antimalarial resistance patterns. This was a hospital-based study, and hence, the prevalence of malaria parasitemia may have been underestimated because many pregnant women, especially in rural areas/villages, do not seek care in antenatal clinics. The inability to carry out PCR testing on the P. falciparum in infected women could perhaps restrict knowing the various antimalarial resistance genetic markers in the study area. The prevalence of malaria was relatively high due to inadequate and/or ineffective preventive measures adopted by pregnant women. Based on findings from this study, there is need for active and continued advocacy programs on the use and adoption of malaria preventive measures by pregnant women in Kaduna. In addition, community-based studies are recommended to understand the genetic epidemiology of antimalarial resistance and its influence on birth outcomes in Kaduna State. World Health Organization. Malaria in Pregnant Women; 2016. Available from: http://www.who.int/malaria/areas/high_risk_groups/pregnancy/en/. [Last accessed on 2016 Jul 24]. Morley LC, Taylor-Robinson AW. Understanding how Plasmodium falciparum binds to the placenta and produces pathology provides a rationale for pregnancy-associated malaria vaccine development. Open Vaccine J 2012;5:8-27. Alibu VP, Egwang TG. Genomics research and malaria control: Great expectations. PLoS Biol 2003;1:E39. World Health Organization. World Malaria Report; 2015. Available from: http://www.who.int/malaria/publications/world-malaria-report-2015/wmr2015-profiles.pdf. [Last accessed on 2016 Aug 04]. World Health Organization. The Health of the People: What Works – The African Regional Health Report; 2014. Available from: http://www.apps.who.int/iris/bitstream/10665/137377/4/9789290232612.pdf. [Last accessed on 2016 Jul 24]. World Health Organization. Chemotherapy of Malaria and Resistance to Antimalarials. WHO Technical Report Series No. 529. Geneva: World Health Organization; 1973. Wernsdorfer WH, Payne D. Drug sensitivity tests in malaria parasites. In: Wernsdorfer WH, McGregor IA, editors. Malaria: Principles and Practice of Malariology. Edinburgh: Churchill Livingstone; 1988. World Health Organization. World Malaria Report; 2015. Available from: http://www.who.int/malaria/publications/world-malaria-report-2015/report/en/. [Last accessed on 2016 Aug 02]. In vitro Micro-test (Mark III) for the Assessment of the Response of Plasmodium falciparum to Chloroquine, Mefloquine, Quinine, Amodiaquine, Sulfadoxine/Pyrimethamine and Artemisinin. Ctd/mal/97.20 Rev. 2 2001. World Health Organization; 2001. Available from: http://www.who.int/malaria/publications/atoz/markiii.pdf. [Last accessed on 2016 Dec 20]. USAID President's Malaria Initiative Nigeria. Malaria Operational Plan FY 2016. Available from: https://www.pmi.gov/docs/default-source/default-document-library/malaria-operational-plans/fy16/fy-2016-nigeria-malaria-operational-plan.pdf?sfvrsn=13. [Last accessed on 2017 Feb 13]. Center for Disease Control. Human Factors and Malaria. Available from: https://www.cdc.gov/malaria/about/biology/human_factors.html. [Last accessed on 2016 Aug 04]. Kinyanjui SM. The Immunology of Malaria. In: Okwa O, editor. Malaria Parasites. Croatia: InTech; 2012. Available from: http://www.intechopen.com/books/malaria-parasites/immunity-tomalaria. [Last accessed on 2016 Aug 03]. Cheesbrough M. District Laboratory practices for Tropical Countries. Vol. 1. New Delhi, India: Jaypee Brothers Medical Publishers Limited; 2005, p. 120-4. Ochei J, Kolhatkar A. Medical Laboratory Science: Theory and Practice. Vol. 3. New Delhi: Tata McGraw-Hill; 2008, p. 383. West PA, Protopopoff N, Wright A, Kivaju Z, Tigererwa R, Mosha FW, et al. Indoor residual spraying in combination with insecticide-treated nets compared to insecticide-treated nets alone for protection against malaria: A cluster randomised trial in Tanzania. PLoS Med 2014;11:e1001630. Ogbu GI, Aimakhu CO, Anzaku AS, Ngwan S, Ogbu DA. Prevalence of malaria parasitemia among asymptomatic women at booking visit in a tertiary hospital, Northcentral Nigeria. J Reprod Biol Health 2015;3:1. Nigeria Malaria Indicator Survey. Key Indicators Reports (PR70). National Malaria Elimination Programme, Federal Republic of Nigeria, Abuja, Nigeria; 2015. http://www.population.gov.ng/images/NMIS2015/. [Last accessed on 2016 Nov 18]. Fana SA, Bunza MD, Anka SA, Imam AU, Nataala SU. Prevalence and risk factors associated with malaria infection among pregnant women in a semi-urban community of North-Western Nigeria. Infect Dis Povert 2015;4:24.
van Eijk AM, Ayisi JG, ter Kuile FO, Misore AO, Otieno JA, Rosen DH, et al. Risk factors for malaria in pregnancy in an urban and peri-urban population in Western Kenya. Trans R Soc Trop Med Hyg 2002;96:586-92. Uneke CJ, Iyare FE, Sunday-Adeoye H, Ajayi JA. Evaluation of maternal malaria at childbirth using rapid diagnostic test and its relationship with birthweight and fetal hemoglobin levels in Nigeria. Int J Obs Gynecol 2008;10:2-7. Rogerson SJ, Chaluluka E, Manjala M, Mkundika P, Mhango C, Molyneux ME. Intermittent sulphadoxine-pyrimethamine in pregnancy: Effectiveness against malaria morbidity in Blantyre, Malawi, 1997-1999. Trans R Soc Trop Med Hyg 2000;94:549-53. Shulman CE, Dorman EK. Importance and prevention of malaria in pregnancy. Trans R Soc Trop Med Hyg 2003;97:30-5. Agomo CO, Oyibo WA. Factors associated with risk of malaria infection among pregnant women in Lagos, Nigeria. Infect Dis Poverty 2013;2:19. Kalilani-Phiri L, Thesing PC, Nyirenda OM, Mawindo P, Madanitsa M, Membe G, et al. Timing of malaria infection during pregnancy has characteristic maternal, infant and placental outcomes. PLoS One 2013;8:e74643. Staalsoe T, Shulman CE, Bulmer JN, Kawuondo K, Marsh K, Hviid L. Variant surface antigen-specific IgG and protection against clinical consequences of pregnancy-associated Plasmodium falciparum malaria. Lancet 2004;363:283-9. Walker PG, Griffin JT, Cairns M, Rogerson SJ, van Eijk AM, ter Kuile F, et al. A model of parity-dependent immunity to placental malaria. Nat Commun 2013;4:1609. Basco LK, Ringwald P. Molecular epidemiology of malaria in Cameroon. X. Evaluation of PFMDR1 mutations as genetic markers for resistance to amino alcohols and artemisinin derivatives. Am J Trop Med Hyg 2002;66:667-71. Fall B, Madamet M, Camara C, Amalvict R, Fall M, Nakoulima A, et al. Plasmodium falciparum in vitro resistance to monodesethylamodiaquine, Dakar, Senegal, 2014. Emerg Infect Dis 2016;22:841-5. Olasehinde GI, Ojurongbe O, Adeyeba AO, Fagade OE, Valecha N, Ayanda IO, et al. In vitro studies on the sensitivity pattern of Plasmodium falciparum to anti-malarial drugs and local herbal extracts. Malar J 2014;13:63. Happi TC, Thomas SM, Gbotosho GO, Falade CO, Akinboye DO, Gerena L, et al. Point mutations in the pfcrt and pfmdr-1 genes of Plasmodium falciparum and clinical response to chloroquine, among malaria patients from Nigeria. Ann Trop Med Parasitol 2003;97:439-51. Ibrahim ML, Gay-Andrieu F, Adehossi E, Lacroix V, Randrianarivelojosia M, Duchemin JB. Field-based evidence for the linkage of pfcrt and pfdhfr drug-resistant malaria genotypes and clinical profiles of severe malaria in Niger. Microbes Infect 2007;9:599-604.